I hope you’re not getting sick of the sight of ice cream. I know- that’s a crazy thing to say but there’s a lot of it around right now with #icecreamweek. My general rule is, I only have one batch in the freezer at any one time, and when that gets used up I can go ahead and make another batch. In fact I have the last of this batch beside me and due to my weird way of eating ice cream this post is taking forever to write. Does anyone else take tiny scoops of the stuff on the tip of the spoon, point the spoon vertically and then lick your tongue upwards licking the ice cream clean off the spoon…anyone?? This time I took Jeni’s dark chocolate recipe and twisted it into something a little different, rich malted chocolate ice cream. Jeni, if you’re reading this I swear I’m not trying to put you out of business but you’re base recipe is just so dang easy to tweak and the taste makes other ice creams shake in their tubs, even the really rich one with the fake Danish name. This recipe called for unsweetened cocoa powder but I used malted Ovaltine powder which gives it more of a candy bar-milkiness to it rather than a bitter dark chocolate taste. This flavor was given the official kid seal of approval in less than four seconds. Now I have to figure out what flavor to make next, any ideas? 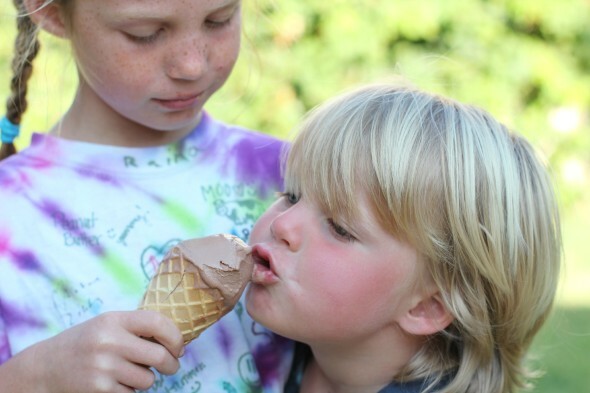 Creamy malted chocolate ice cream is perfect on a hot day!! In a small sauce pan bring the Ovaltine, coffee and sugar to a simmer. Take it off the heat and add the chocolate. Stir and set aside. Take 2 tbsp of the milk and mix it in a small cup with the cornstarch, set aside. Whisk the cream cheese and salt together until smooth. Add the chocolate mixture gradually and whisk until well combined. Mix the rest of the milk, sugar, cream and corn syrup in a 4 quart pot. Bring to a boil and simmer for 4 minutes. Take the pot from the heat and add the cornstarch mixture. Bring the mixture back to a simmer and cook for about 2 more minutes and you see it getting a little thicker. Slowly add the milk mixture to the chocolate, whisking to remove any lumps. Transfer the completed mix to a one quart zip lock bag, seal and place in an ice water bath for about 30 minutes. Pour the contents of the bag into the canister of your ice cream maker and follow the instructions. Allow at least 4 hours freezing time before eating. Have I told you lately how adorable your kids are? This ice cream sounds dynamite- I love anything with malt. No you have not, but thanks! I’ll see you at IFBC will I not? I’ve made vanilla malted ice cream before and loved it. I’m not a huge fan of straight chocolate ice cream but maybe with the malt addition I would! Hey Erin, the malt kinda makes it creamier and not so harsh of a chocolate flavor. Your tweet, naturally, got my attention. Now this ice cream is keeping it! Fantastic – and I agree with Jen… your kids are so darn adorable! Your children are beautiful. Absolutely adorable! The ice cream looks amazing too – as for ideas – I always love what you come up with. I did see something about a ginger ice cream the other day – don’t remember where but thought it sounded pretty good with chopped crystallized ginger. Yum! Your kids are so sweet and adorable. I love the click of your daughter eating ice cream…she is so pretty. 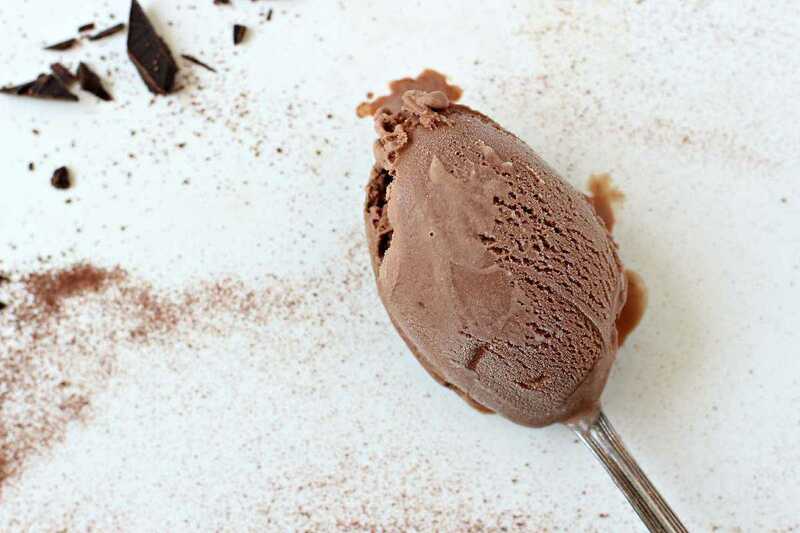 Malted chocolate ice cream looks so creamy and tasty, Gerry. 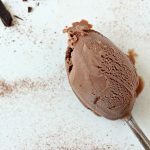 I love the idea of malt + chocolate – what a dreamy ice cream combo! Oh my gosh, those kids! I could squeeze them! You have beautiful kids! Also, can we talk about this ice cream? Fabulous! Oh my gosh, wow!! This is my kind of ice cream! Chocolate all the way! I want a huge cone right now!! Oh and yeah, I agree with everyone else. Your kids are so cute! 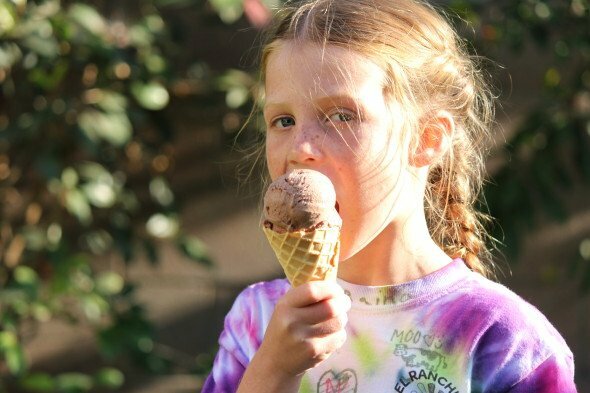 You can’t get much better than homemade ice cream unless is homemade chocolate ice cream. Looks so yummy! I love chocolate malts so I could definitely go for a cone! Your kids make great models ;). I could never get sick of ice cream. I’m the same way. I just got my ice cream maker this summer and every time one batch runs out I’m making the next one. Love the idea of malted chocolate. So good! This sounds excellent! I always associate malt with Whoppers, and forget that it has so many other delicious uses. Thanks for sharing this recipe. I’ve got a hankering to whip this up for myself, now! Now I’m craving malted milk balls AND your ice cream! I am loving this ice cream week! And those pics of your kiddos are adorable! Love love love LOVE our Cuisinart ice cream maker. That thing is a dream, gone are the hours of churning homemade ice cream. I still remember the first time I had malted chocolate. Life changed. This ice cream sounds delicious!